The next Abingdon Bun Throwing has been confirmed to take place on Saturday 11th June and is being held to celebrate the Queen's 90th birthday. 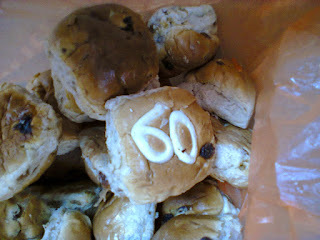 It'll be the first occasion the 'rejoicing buns' have been thrown to the crowd of thousands since 2012. On special occasions since 1761 townsfolk have gathered in the marketplace in front of the old county hall in attempt to catch a special hot cross bun. The first event was held to celebrate the coronation of King George III. The 2016 bun throwing will be the 34th since the tradition began. I have attended each Bun Throwing in Abingdon in my lifetime, a total of thirteen since 1981. I'm looking forward to returning to Abingdon for the next event.